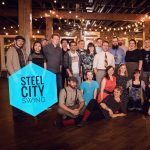 Steel City Swing is a group of people who just love Lindy Hop! 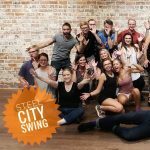 Steel City Swing hosts social dances and offers swing dancing lessons to all ages in Birmingham, Alabama. Classes offered include Lindy Hop, East Coast Swing, Charleston, Balboa, Solo Jazz and more. Weekly group lessons are offered on Monday nights. Includes group lesson 7pm – 8pm and social dance practice time from 8pm -10pm.